Longanisa's striking crimson color stops you in your tracks when you first come across it, but its spicy, complex taste, pungent aroma and ease-of-cooking hook you and keep you coming back for more. Longanisa comes in about as many forms as a sausage can, but you only have to cook fresh longanisa, which you find both loose and packed into hog casings. Like chorizo, which is similar in color and taste, longanisa comprises about 70 percent lean pork and 30 percent fatback, so you can gently poach it to a safe internal temperature, then crisp it in its own fat. Thaw the longanisa sausages on a plate in the refrigerator for about 8 hours if frozen. 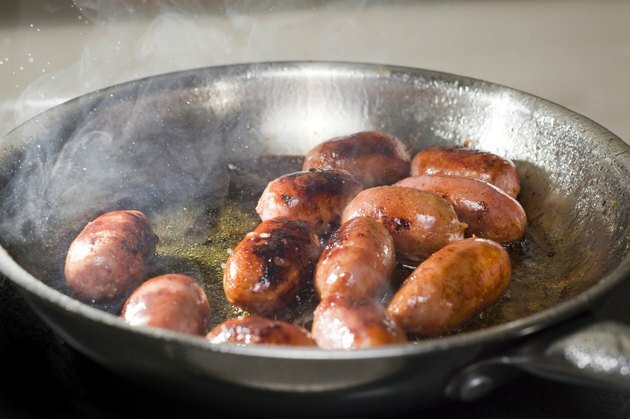 Place the sausages in a straight-sided pan and cover them with about 1/2 inch of water. Set the pan on the stove over medium-high heat and simmer until the water evaporates, about 15 to 20 minutes. Saute until the casing crisps, about 10 minutes, rolling the sausages in the pan as needed to cook all sides evenly. Drain the longanisa on a few paper towels and serve immediately. Form the longanisa into patties about 1/2 inch thick and 3 inches wide or place a palmful of longanisa on a piece of plastic wrap and roll it into a tight cylinder. You can also spred the longanisa in an even layer in the bottom of an oiled saute pan. Heat a scant amount of oil in a saute pan and set it over medium heat. Heat the oil for a few minutes and add the sausage. If you rolled the longanisa, carefully unwrap it before placing it in the pan. Fry for 2 to 3 minutes before turning the patties over with a spatula or stirring the loose sausage. Roll the rolled longanisas in the pan to cook them on all sides without breaking them. Fry the longanisa for about 8 to 10 more minutes, stirring or turning every 2 or 3 minutes. Fully cooked longanisa sausage has no traces of pink inside, and the juices run clear. Drain the longanisa on a plate lined with a few paper towels and blot the top with a paper towel. Serve immediately. You can also roast cased and loose longanisa in a shallow dish in a 350-degree-Fahrenheit oven for 15 to 20 minutes if you like. Insert an instant-read thermometer in longanisa lengthwise to check for a safe internal temperature of 165 degrees Fahrenheit.